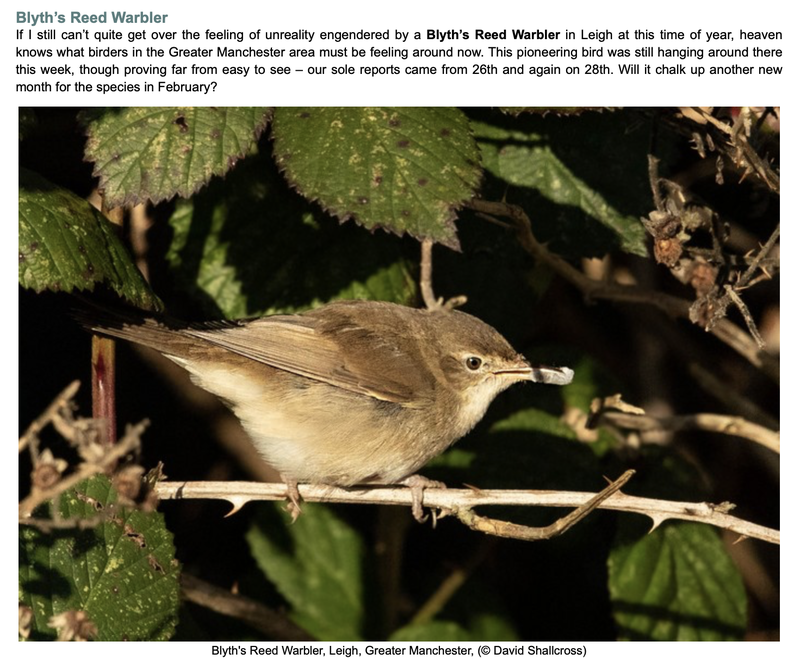 A rare Blyth's Reed Warbler was found by Phil Rhodes at Hope Carr Nature Reserve / Sewage Works in Leigh last week (yes, birders really do get to some picturesque places don't they?). I'm told that this is the first time ever that one has been seen in Greater Manchester and that less than 10 a year are seen in the UK as a whole. I myself have been three times to find this bird and spent about nine hours of waiting with just a Chiffchaff, Wren and a few Linnets and Pied Wagtails being seen. The reason for the title is that the bird is a very active skulker in the brambles and never appears out in the open for long. The photo below shows the bird feeding on a spider's egg sacks and was taken by our chairman David Shallcross on one of its rare appearances. It was featured in this week's Rare Bird Alert weekly roundup. I am trying to get the original finder to write a brief report on how he found it, how it was first thought to be a Reed Warbler and how the story progressed to its final determination of being a Blyth's Reed Warbler - so watch this space. I have finally got round to updating the Society's bi-monthly and annual reports on our main website. These are in PDF format and are free for anyone to read, download and print with the exception that the latest newsletters are only available to members in the first instance. As a special 'one-time only' incentive to encourage readers, the January 2019 newsletter is available now. In the fullness of time, they all eventually become available in the public domain. Click the link below to go to the page where they are linked and please let me know if you can't open them or if there are any other problems with the links.